This bohemian dress has so many things we love--and it comes in two color options for you to choose from! The Open Shoulder Tie Front Lace Dress is lined below the waist and is made of a gauzy fabric. It has a rounded neckline with a hook and eye closure at the front, open shoulders, and a flowy cut. Lace trim at the bodice and sleeves adds a pretty touch to this dress. An included rope belt wraps around the waist and can be tied into a bow in the front. The Open Shoulder Tie Front Lace Dress is a cute dress to wear casually to any festival or concert. It looks nice dressed down with gladiator sandals. Or dress it up with wedges, heels, or boots. This dress is a cute wardrobe staple to have on hand for so many occasions. Details: Lined below waist. 100% rayon. Contrast: 75% polyamide, 25% cotton. Lining: 100% cotton. Hand wash cold water. Do not bleach. Line dry. Iron low. Do not dry clean. Small measurements: Length from top of shoulder to hemline: 33". Bust: 32". 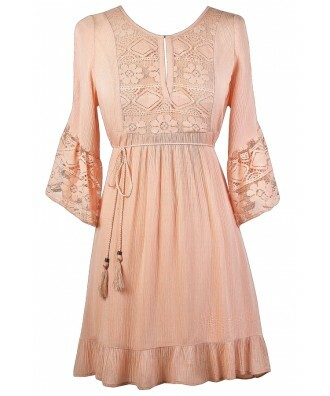 You have added Open Shoulder Tie Front Lace Dress in Blush into Wishlist. 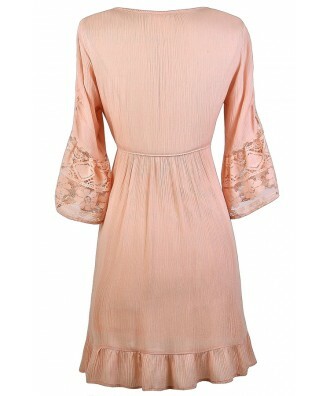 You have added Open Shoulder Tie Front Lace Dress in Blush for Stock Notification. 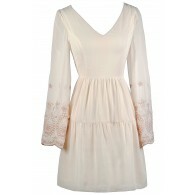 You have set Open Shoulder Tie Front Lace Dress in Blush as a loved product. You have removed Open Shoulder Tie Front Lace Dress in Blush as a loved product.